Turning 180-degrees to the driver’s side, the Phoenix Mini Max features a Thetford C402C cassette toilet with an electric push-button flush, 4-gallon flush tank, and 5.1 gallon removable black tank/cassette. 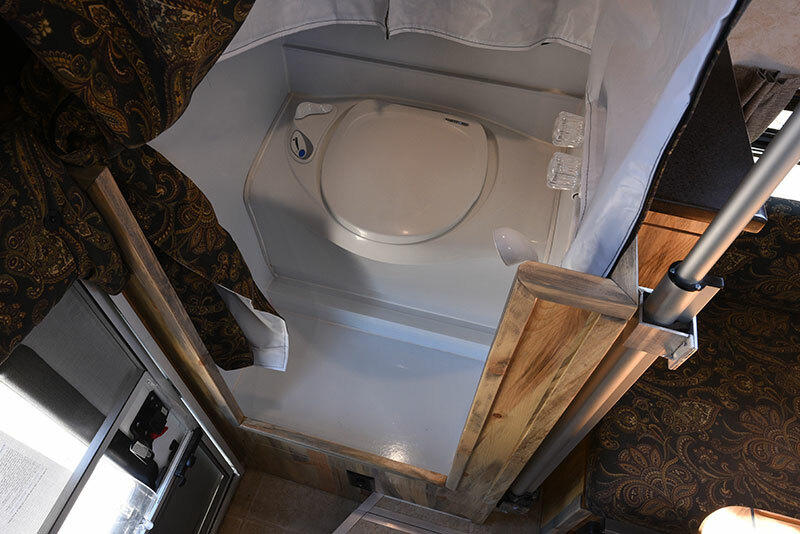 The bathroom itself is formed by a stitched vinyl and fabric enclosure that expands to create the bathroom and shower space when the camper roof is lifted into the camping position. To enter and use the bathroom, simply open the fabric envelope, step into the bathroom, and zipper the two sides together for privacy. The heavy-duty white vinyl inside the bathroom is waterproof for sit-down indoor showering. You can see the shower controls and hand-held shower head on the right side of the shower stall. While the two-layer fabric wall doesn’t create the same level of privacy or water barrier that a hard wall bathroom would provide, it offers a lot more privacy than a porta-potty in the middle of an open camper, or an outside shower for that matter. No doubt many readers are wondering what it’s like to actually be inside this bathroom in real life. Well, it’s small, but the bright LED light on the ceiling and white vinyl walls make it feel bright and inviting. There was just enough leg room to sit down comfortably (but no more). Once sitting, there was obviously plenty of headroom and I never felt closed-in. I’ll sum up this way; I would take this small fabric bathroom every day of the week over the a porta-potty and/or an open-air outside shower. It’s also critical to remember that this camper is designed for super short bed trucks. 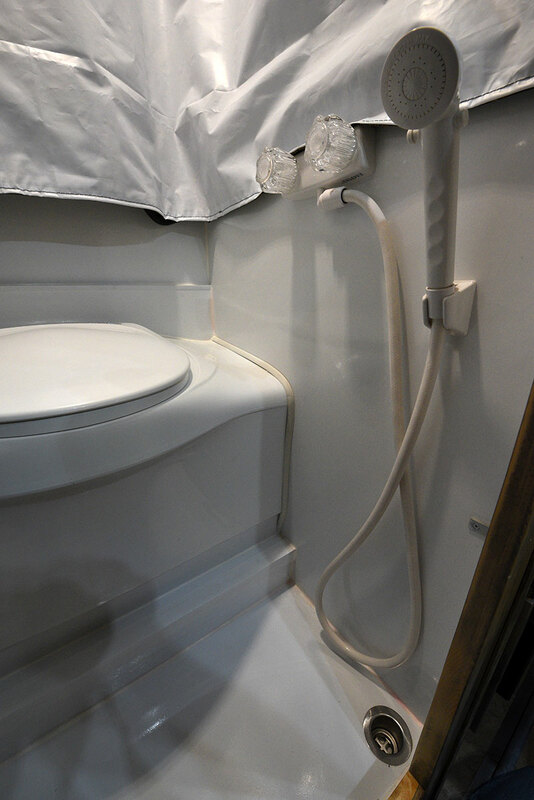 To have a private flush toilet and sit-down shower in a camper package this small is simply awesome. Yeah, we get this excited about bathrooms in the truck camper world.